First I would like to say: Thank you for your patience! I know many of you are anxious to play Optera. I know the feeling. The design phase is a tedious one but I believe once this part of creating Optera is over and help is recruited things will begin moving at a much more satisfying pace. Laying the foundation for Optera is an important step and one I hope to do well. I have been directing my focus to what is probably two of the most important aspects of gameplay in Optera- “Nest management” and “Colony management”. I name them separately because although intertwined and dependent on one another, they are two completely different things. Managing the colony is the act of creating tasks and assigning members of the colony to those tasks. Tasks can be as simple as having two steps (pick up egg at location, drop egg at location), or can be much more complicated involving many steps. Steps in tasks can also rely on steps of a completely separate task. This will allow players to create a complex web of interwoven tasks that function at specific times and rely on specific conditions. In this way Optera will maintain a careful balance between the up close and personal micromanagement style of games such as StarCraft and Command and Conquer and the distant macro management style of games like SimCity. In the beginning of your colony’s life you may only have a few workers and control them independently in true Real Time Strategy fashion. As the season passes you may find yourself overwhelmed with the amount of work that needs to be done in order to maintain a colony of a large population. You will begin to create tasks in the Colony management panel to ensure simple repeatable jobs are taken care of regularly. These tasks will take time to setup and coordinate but will ultimately save time and allow you to focus on other things such as the nearest neighboring players colony attempting to steal your precious aphids. One part of Colony management will fall under the category of Nest management. The first task a player likely creates will be a digging job. Players will have the option to manually move individual pieces of soil around inside the nest but they will also have the option to design a grander vision. Players can mark out areas to be excavated within the Colony management panel. If a player marks out 17mm³ to be removed they will then have 17mm³ to deposit somewhere else. They can use that soil to fill in an area of the nest, to narrow a passage that is too wide, dump it on the surface above ground, block off a passage, or do a combination of these. 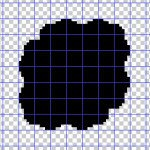 As I said in a previous post soil particles will be arranged on a grid. Each point on the grid represents 0.25mm³. The particles that are used to visualize each quarter of a mm³ will be variable in size. 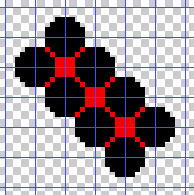 These different sized particles will give the walls of tunnels and rooms a more natural look and not so grid like. In horizontal and vertical directions the large and small particles will alternate. I will show you some images explaining this. 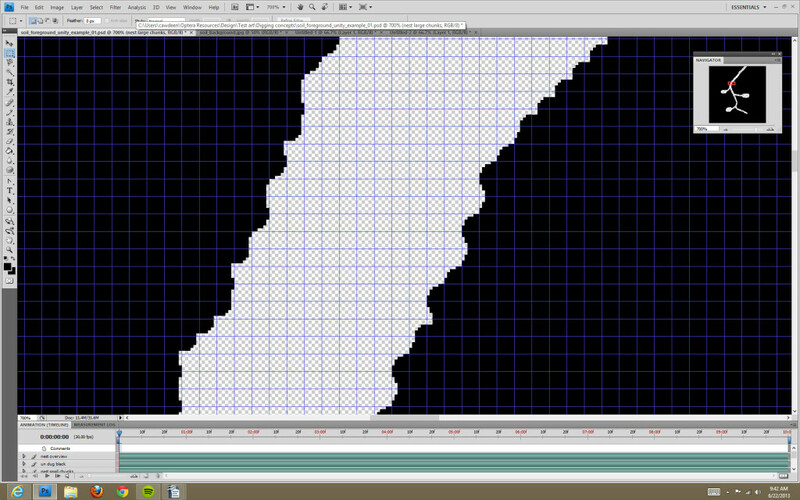 Ill make the large and small particles different colors so the final effect can be understood. 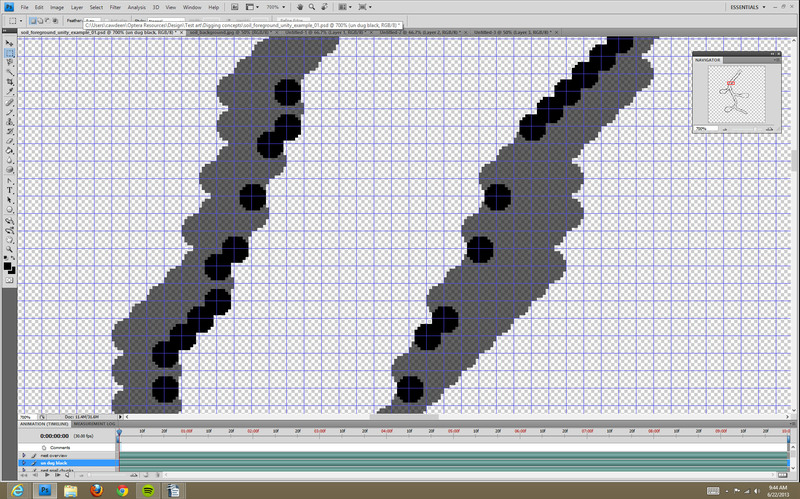 First take a look at how the large particles skip every other grid point horizontally and vertically. 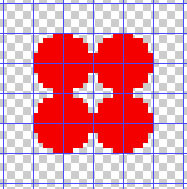 You may notice how there is a row in between the red dots both vertically and horizontally. That row will act the same as the two on either side except that the points will be moved over one. 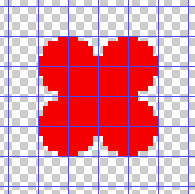 This image shows how three large particles will be placed on a diagonal. Now what about the points directly to the top, bottom, left, and right of each large particle? They are currently empty. This is where the small particles are placed. Ill show them in black. 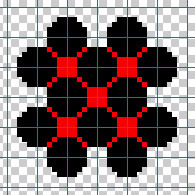 Now lets look at the diagonal configuration we saw in the second image only this time we will add the small chunks as well. 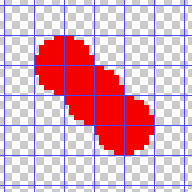 Now lets look at image three with the added small particles. If we create a more organic shape you will be able to see why the different sized particles help to make the shape look more natural. Lets take a look at it in red and black to see the arrangement of the large and small particles and then all in black so we can see the final silhouette created. If we arrange some large particles on a grid to represent a tunnel we can get an idea of what we will see in game. It looks a little grid like right now. That’s because it is only the large particles. Lets add some small ones to the edge along the tunnel and see what that does. That is much more organic looking. Thanks for reading and check back for more details. In part 2 of my posts on nest management I will be explaining a bit more about this system and getting into humidity, temperature, and soil saturation! This is a great way to make things look natural. 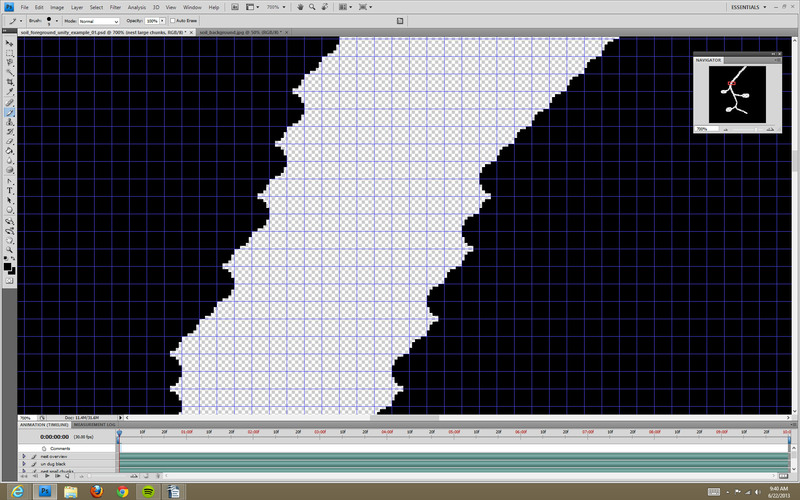 I’m not sure how you are going to get the texture to not look tiled though. Maybe you could have a lot of different textures for the different particles of dirt e.g. sand different stone fragments and the such like. Also add some very large particles as soil often has lots of denser material mixed in with it maybe adding root systems as a random spawn and the such like you could even incorporate it in the game with root aphid farming. Really looking forward to part two of this 😀 Keep up the good work! I will be sending out a newsletter very soon. I have a few items I would like to talk about that will probably be put into separate posts throughout autumn. Thank you so much for your patience and lasting interest in the project!